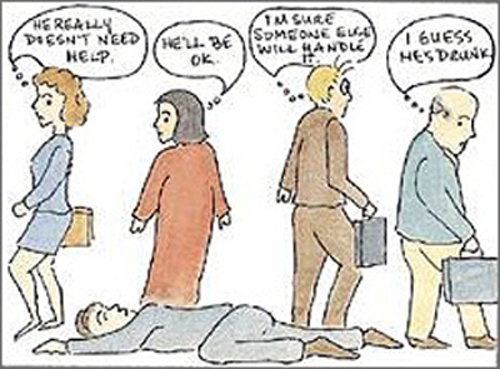 The Bystander Effect and why people don't call for help when they see violent crimes. While we don't talk about the events at Penn State, this was the inspiration for this topic. From this we go on to talk about legislation that has been proposed to make it a crime for health care workers (including shrinks) to not report child abuse. As is, there are mandatory reporting laws and licensing implications for those who do not report instances of child abuse. Finally, we move on to happier techy stuff and discuss Depression Rating Apps. It was good, just finished it! The whole duty to warn thing makes me really reticent to discuss when I've been making plans for suicide. It's a cath-22, cause he can help me sort through that stuff, but then if I'm really wanting to, why would I give it away and/or possibly put him in a situation where he might need to tell at least my husband, let alone anyone else? There's been two times he's told me, you need to tell your husband x, or y, whatever, or he'd tell him himself. One was, telling my husband he'd better hide all the meds in the house, and dole them out as needed (except for small quantities I kept in my weekly pill minders). Psychologist was concerned enough about harm to myself that he had a duty to let my husband know of the danger, but he gave me the option of telling. I forget what the other time was. If this ever happens again, I'm not doing his work for him, he can do it; maybe it's just cause I'm really depressed right now and wouldn't want to tell anybody anything. um I hope it's not a catheter 22 that sounds like a large gage catheter . . .lol! I'll take the 24 or even the 26 :) Neonatal Intensive Care makes all those adult sizes sound ridic. But actually I periodically have to go for IV infusions and if I don't have a PICC in place, then a 24 is usually all my veins can take. Sarebear: I hope you're feeling better. Wishing you and your peeps the gentlest of holidays, and thanks for hanging out with us for so many years on Shrink Rap. You are the best! Carrie: You are also the best (there can be more than one best, I just decided that) and thanks for all your support. To the rest of you: Please don't stick large or small bore needles into the Shrink Rappers. We make shrill noises and deflate. Thanks Dinah I am a bit. Are you also saying you guys are full of hot or cold air? Bwahahahahahaaa . . .